CTE is named expression that holds result of Sub-select temporarily. 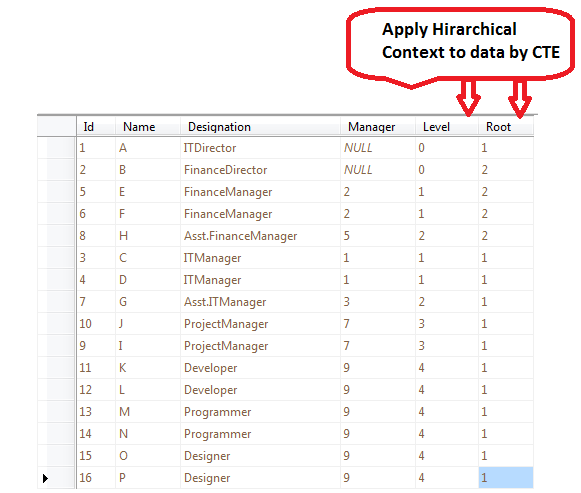 The main advantage of CTE is light-weight and recursion; hence it is ultimate choice for navigating hierarchical data. A CTE is essentially a disposable view, and can be used in place of derived tables. CTE is defined by WITH-Keyword, and it is best practice to begin CTE with Semi-column, since CTE is not single-statement it is batch of statement. CTE can be used in SELECT, INSERT, UPDATE or DELETE statement. But SELECT is desired. CTE is single-time visible to sub-sequent query only. CTE can be used to define VIEWS as part of View’s SELECT query. Recursive-CTE calls itself whereas Non-Recursive does not. It is best practice to use MAXRECURSION to prevent infinite loops in Recursive-CTE. CTE (Recursive) mainly used for navigating hierarchical data. CTE (Non-Recursive) is substitutable to derived-table (or Inline-view or Sub-Query); Since CTE and Derived Table are non-persistent and have same visibility. CTE is not substitutable to Temp-Table or Table-Variable; Because CTE and TempTable are differ based on: Visibility and Persistency; CTE visibility is limited to only a single SQL statement that would very first to it; whereas Temp-Table or Table-Variable is visible to at-least current scope where they defined and Temp-Table are persistent to Db. CTE can be defined in SUB-ROUTIENS such as user-defined functions, stored procedures triggers or views. You can define cursor on CTE-referenced Select Query. Light-weight: CTEs are light-weight than Temporary-tables (or Table-Variable). Since, they are non-persistent and do not write any schema information or business-data to disk. The second thing is that CTEs get cleaned up automatically by SQL Server. Therefore, CTE does not create any maintenance over-head and no performance impact. Readability: CTE improves readability; this is awesome aspect that developers always look for. CTE separates data extraction from your main query. Consider a complex query containing multiple joins, data filter operations, group by etc. Using CTE, you can put all JOIN-operations in one CTE-variable; and all filters in another CTE variable then conveniently access them in your query. This will rapidly increase readability of your query. Hence, CTE is substitutable to Derived Table. expression_name = The name of the common table expression. column_name [ ,...n ] = The unique column names of the expression. 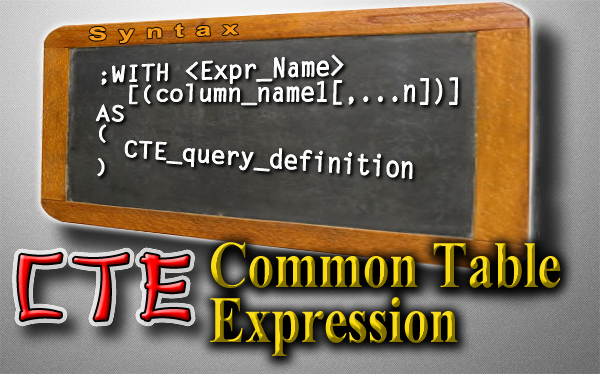 CTE_query_definition = The SELECT query that defines the common table expression. Simple-CTE: Defining a table expression with WITH statement. Multiple CTEs using single WITH AS statement. 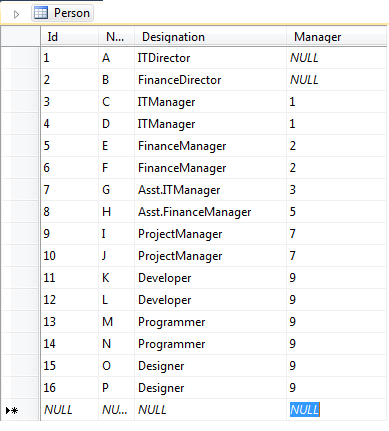 Implementing self join to derived table using CTE. Recursive-CTE allows you to write hierarchical queries. Recursive-CTE works as cursor in first iteration AnchorQuery executed and in sub-sequent iteration RecursiveQuery executed. Anchor Select Query is executed only once and it holds result of recursion. But Recursive Select query executed multiple times repeatedly. The FROM-Clause of Recursive-Select must refer CTE at most once. The no. 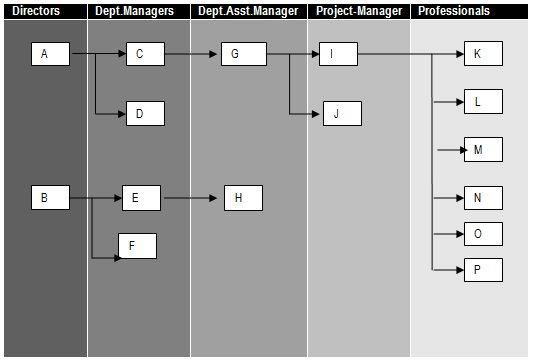 of and type of columns in Anchor-Select and Recursive-Select must be same. We omit CTE definition in examples; Just copy it from above example and apply or you can define CTE in separate View and access in your query. You need to hold result set temporarily for a single query only. Your query is large and contains multiple joins.